Posted April 12, 2016 by trekkit & filed under By Rodney, norway, trekkit. 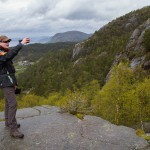 We spent the night at the Preikestolen hostel, conveniently located at the start of the trail to Pulpit Rock. Take note of the grassed roof on the buildings – these are fairly common in Norway. The advantages of grassed roofs (also called sod roofs) are many. They are very heavy, so they help to stabilize the house during high winds. A grassed roof also provides good insulation and they are long-lasting. 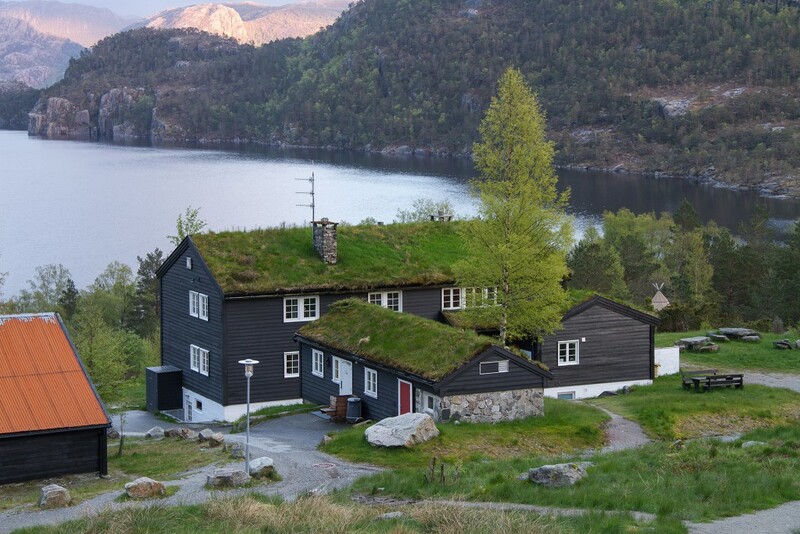 During the Viking and Middle Ages, most houses in Norway had sod roofs. The hostel was clean and nice but the rooms could only be described as “cozy”. There was a small set of bunk beds but barely enough space to turn around in the room. Bedding was even included in the price of the room (more on that in a later blog), but you had to pay extra for a towel. That evening we each had a muffin in the main lodge. It was perhaps the world’s most expensive muffin – but it definitely was not the best muffin I have ever had. In general, food was quite expensive in Norway. The cost for everything is more expensive. However, Norway is one of the wealthiest countries in the world. I was surprised to learn that in Norway, personal income and wealth are public record, easily viewable online. It is also considered rude to flaunt your wealth. 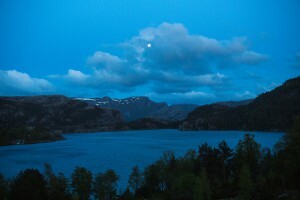 That evening we were treated to a beautiful sky and view of the moon over the lake (Revsvatnet) immediately behind the hostel. Unfortunately, we awoke to heavy rain the next morning. Ryan was a bit surprised by the casualness of those using the unisex bathroom and shower facilities in the hostel – what I understand to be the more cultural norm in many European countries. Ryan had serious problems using the shower himself the next morning after he discovered that the shower door had no lock. With people (including women) in the common bathroom just outside, Ryan meanwhile was trying to shower – which can be difficult if you have to hold the door closed with your leg extended at all times – an image I still haven’t fully formulated in my mind. While having breakfast we watched the water run down the windows in thick sheets – it was raining hard! 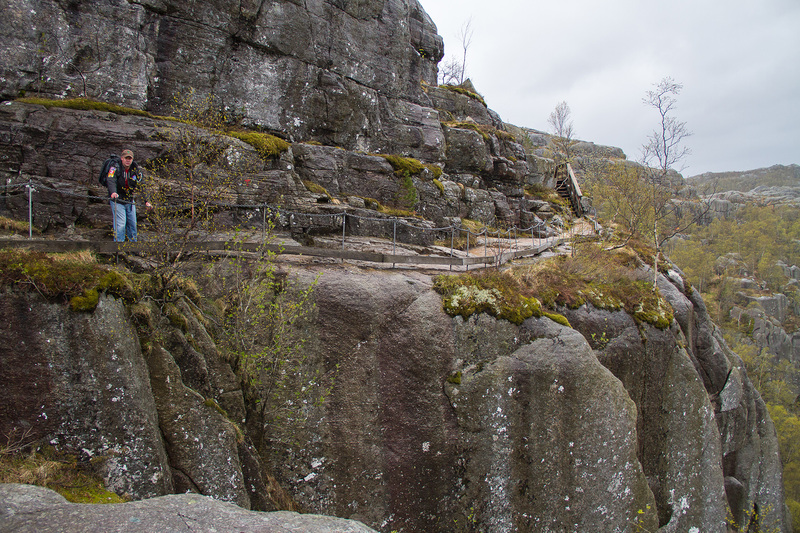 Instead of a hike, we went exploring in the nearby town of Jørpeland that morning where Ryan finally got his SIM card for his phone. He couldn’t believe how cheap the data package was. 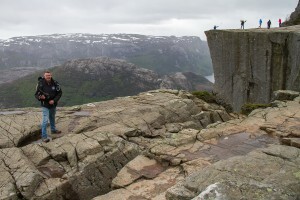 Even if he tried, he wouldn’t be able to use all the available data usage while in Norway. 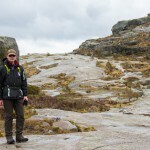 By 11 am the rain was beginning to subside so we got our gear together and started off on the 2 hour hike (4.2 km) to Preikestolen, commonly referred to as the Pulpit Rock. 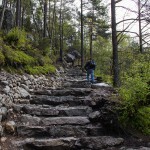 In recent years a team of skilled stonemasons and Sherpa from Nepal have done an impressive job of improving the path. 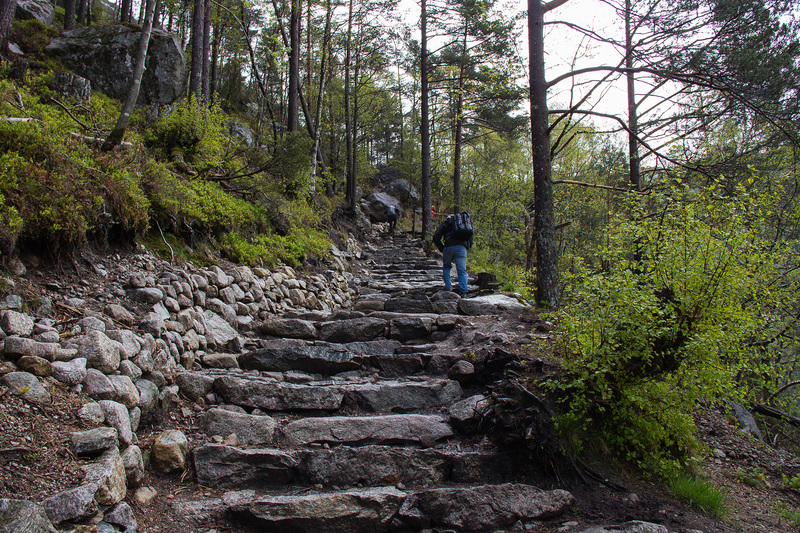 Steps have been built in the roughest areas, and a rocky trail has been made to keep the impact on the environment localized and to a minimum. We left the parking area about 40 minutes behind a group that was staying in our hostel – we passed them after only 25 minutes (they were very slow). 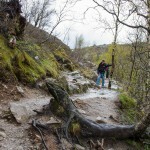 The hike was strenuous as the terrain was rough with many changes in elevation. The hiking trail itself provided great scenery along its entire length and although difficult at times, it can be traversed by almost anyone. The view from the plateau was amazing! Pulpit Rock is only 25 m x 25 m in area and stands 604 m above the Lysefjord, and receives well over 200,000 visitors every year, making it one of the most popular tourist destinations in Norway. 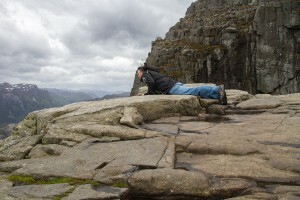 Like most visitors, Ryan and I each took turns crawling to the edge and peering over. Normally, I am not bothered by heights but I must admit that I was very nervous near the edge – perhaps it was the combination of the strong winds and all the people (or maybe just that it was over 600 m straight down). 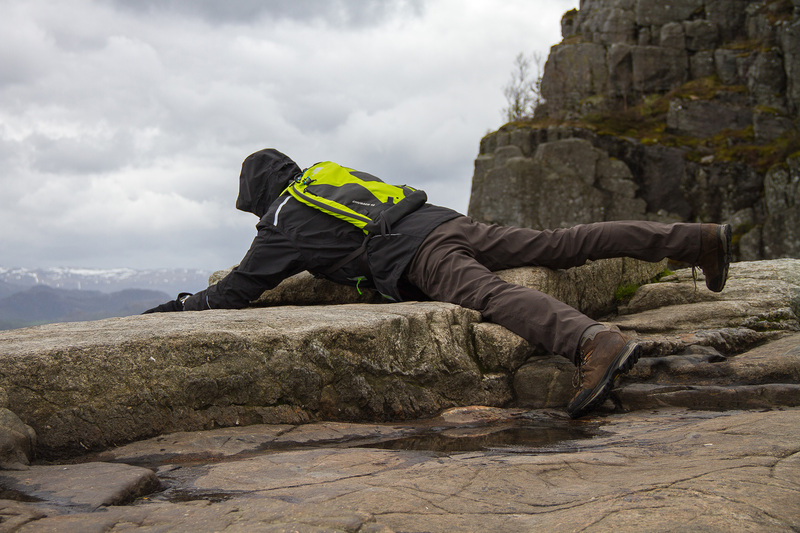 Imagine that if someone accidently bumped into you, you could just fall over the edge. While setting up for some video , we watched a group of teenage girls sitting on the edge for a picture and I seriously though that one, if not two, of them might fall off at one point due to their inattention. Reportedly, only one tourist (from Spain in 2013) has ever fallen off Pulpit Rock. 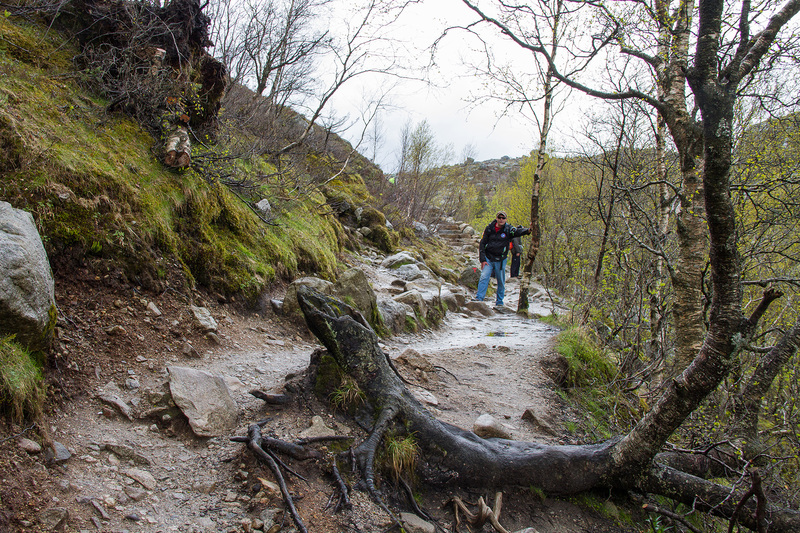 Even portions of the trail to the site that passed along the fjord cliffs were a bit unnerving at times. 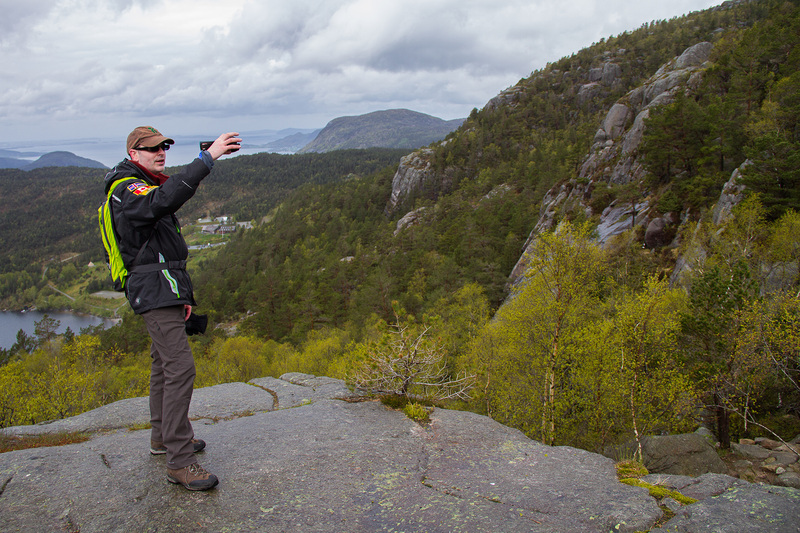 To see more about our adventure in Norway, click here to watch Norway: The Road Trip – Part II. 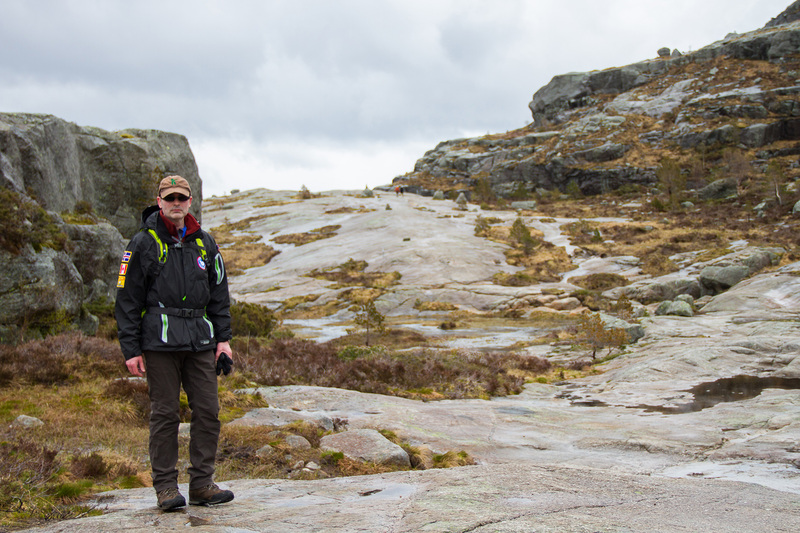 To keep up with all things Trekkit please click here to subscribe to our newsletter.